For some reason, every time a stay at a “fancy” hotel, I always end up with some of their shampoo/shower gel/body cream bottles in my luggage. It’s a curse! But they look pretty and I can’t seem to contain myself 😉 They are just sooooooo cute. I don’t have a lot of them, but I’ve been saving the pretty ones for my guests. And I always lay out a nice towel and some “hotel” shampoo/shower gel for them to use, when I have people staying over. So why haven’t they gotten used up long time ago? Well it turns out, my guest tends to bring their own stuff! And not only do they bring their own stuff, they even leave some stuff at my place if it’s almost used up. So what happens? Well, I get an even more excess of shampoos and shower gels. NB! 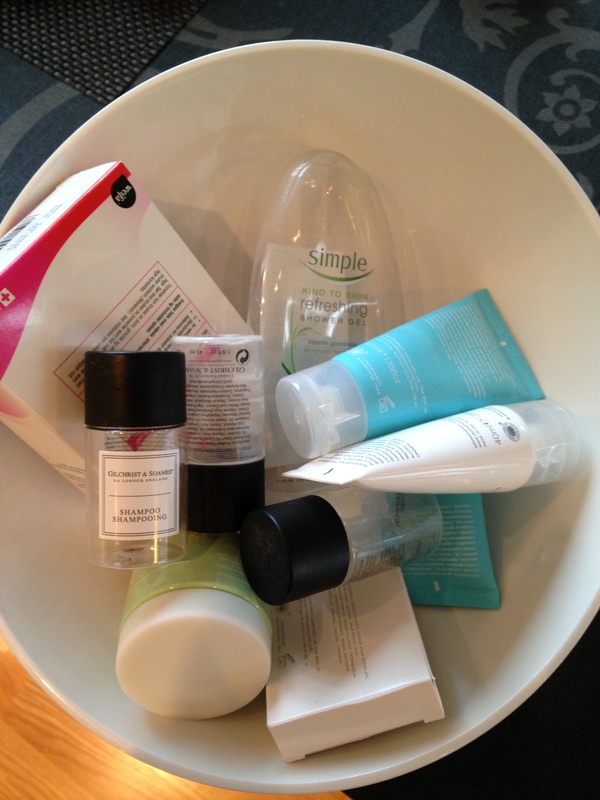 A little note for the thrifty out there 😉 Since the hotels tend to toss what’s left of the soaps, shampoos when you leave the hotel, you might as well bring it with you, and use it up at home. It’s what I do! At my work we set up a useful unwanted items box. When there’s something like this you put it in the box. Someone else will take it and use it for their sports bag or something. I love hotel freebies! Great for guests or for traveling or just trying new products! This is exactly what I’m doing! And have done…….putting them out for guests, I mean. But I am trying to use them. I just rummaged through my stash yesterday. Candy of every kind is my favorite 🙂 I just nomintaed you for a Liebster Award. You can read more about it here – http://itstidytime.wordpress.com/2014/03/18/liebster-award-nomination/. Have an awesome week! You bet! I have a feeling you’ll come up with some good ones 🙂 Can’t wait to read your new post!